Handmade Gifting - Make Your Own DIY Card Bundles! I am a sucker for handmade things. In the kitchen, in the craft room, and especially in gift-giving! Every now and again, I love to design a batch of cards with someone in mind as inspiration, and then share the cards with them. This particular set was designed with my mom in mind. She spends much of the Summer in her garden, tending to the plants, and just like the beautiful greenery, she comes alive during our short, but wonderful growing season. I love watching her get excited when the first berries start to pop up, or talking with her about what new recipes she will try out when harvest is upon us. 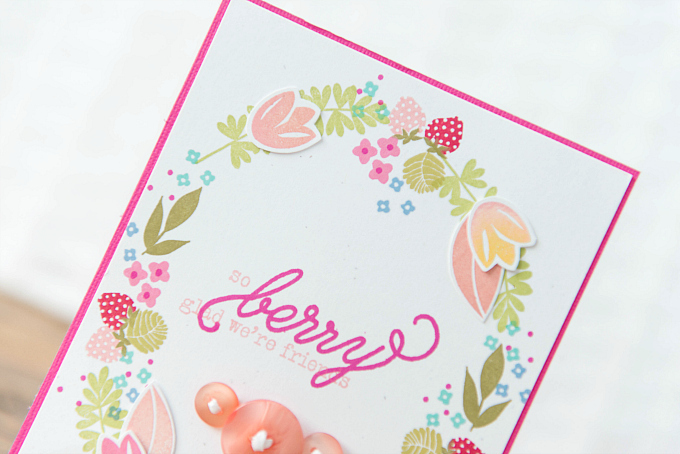 Many of the cards in this set are splashed with colorful blooms and lots and lots of stamped details. They're simple, and most are flat, so that they can be mailed. 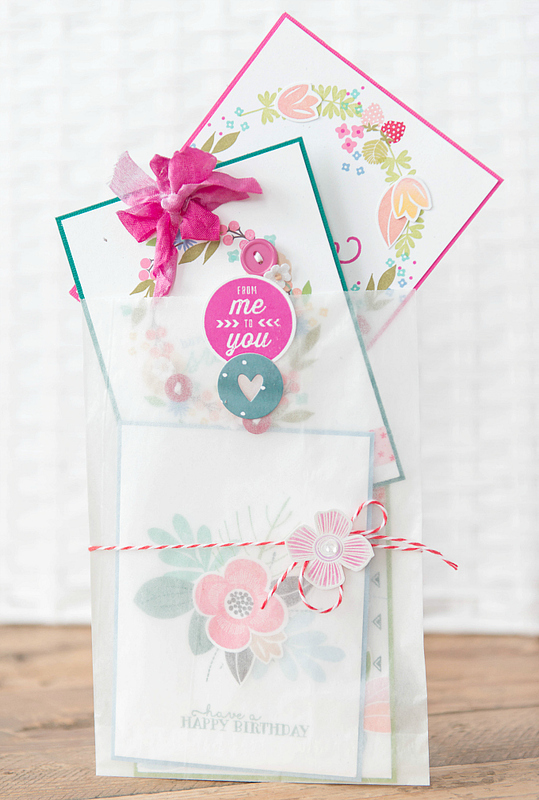 (Last thing you want the recipient to worry about is how to find an envelope for that gorgeous, but oh-so-bulky card!) I also love that anyone can really create these. Yes, there is a little bit of investment required up front, but who says you need a bunch of stamps, or a bunch of different ink. 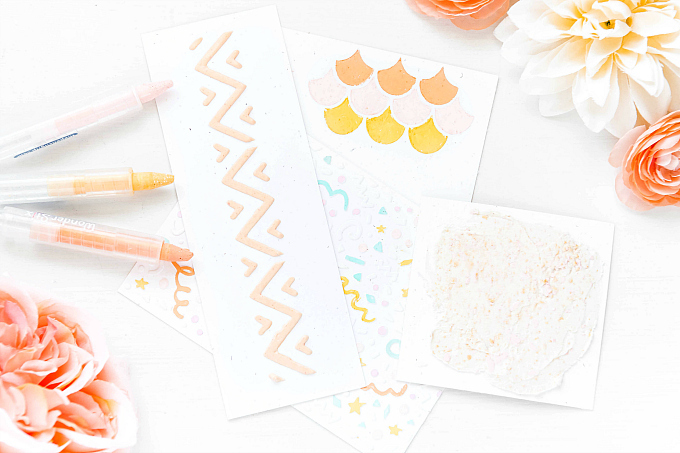 Pick a few papers, a stamp set you love and a few colors of ink, and spend the day stamping. Next to reading a great book, it's my favorite outdoor summertime activity - just as long as it's not terribly windy! I really fell in love with the colors while I was designing this set, so I've created another batch that you can find in my Etsy shoppe. To start, I decided on four simple but colorful versions of plants, flowers, and berries, with varied sentiments (I think this is key so they can be used for common occasions). 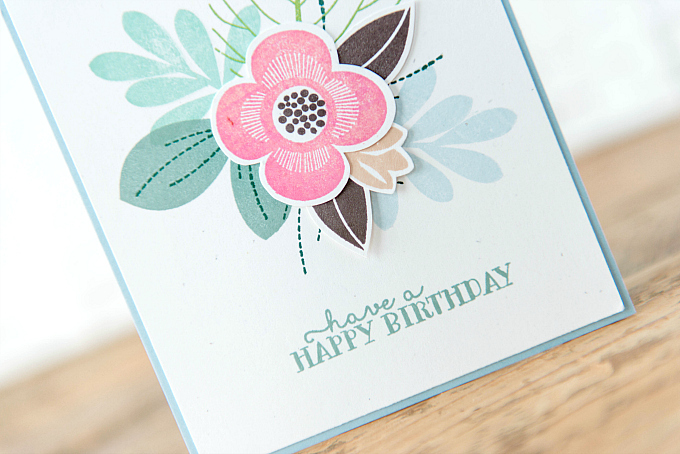 I then decided on a color palette for each card, and started stamping away! I find it easiest to pre-stamp a variety of flowers, cut them out, and then work on the cards themselves. 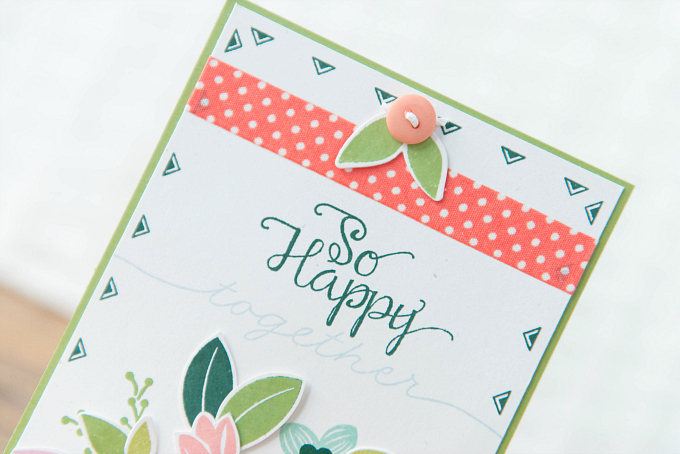 This way, when I'm stamping, if I feel a little texture is needed, I can pop in one of the pre-cut flowers and I don't have to switch gears. So here they are! The first card is a wreath card, with general sentiment. 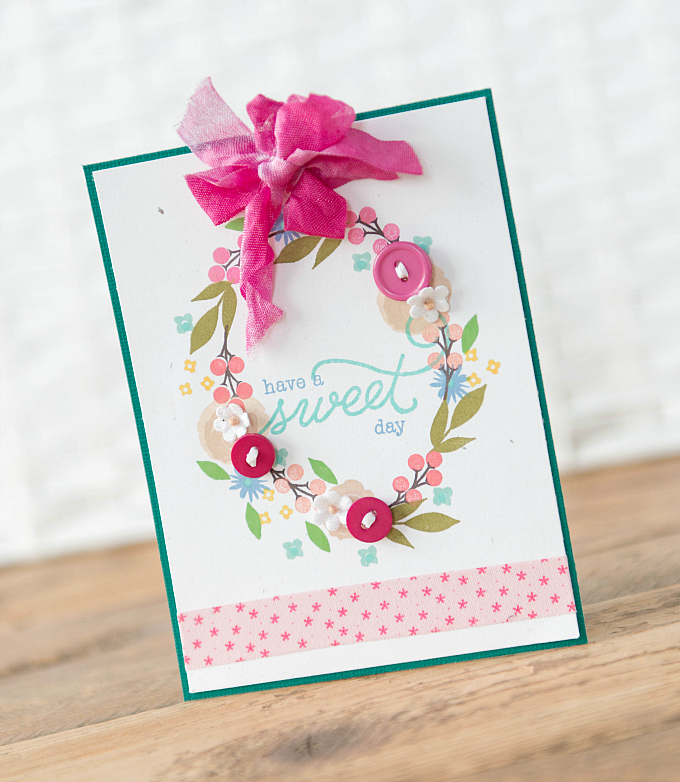 I used a combination of stamps to create the wreath, simply by stamping around in a variety of inks. 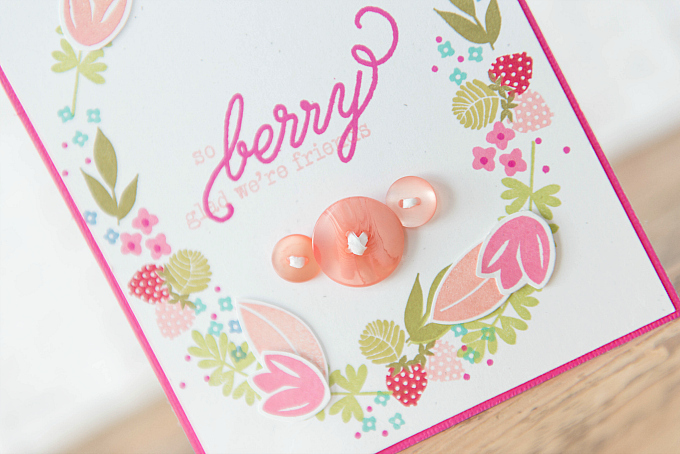 The stamps I used are: Papertrey Ink Strawberry Patch Sentiments, and WPlus9 Fresh Cut Florals. 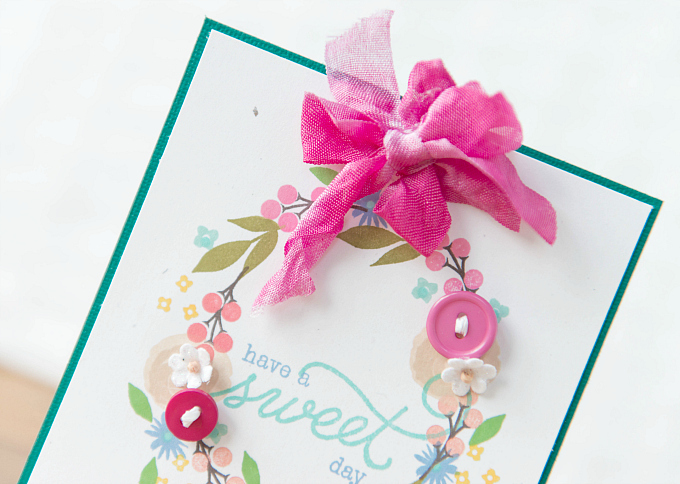 This card is the most textured and features a bow and a few buttons. At the bottom, I used a strip of fabric washi tape and adorned the wreath with a few petite paper flowers which remind me of freshly bloomed strawberry flowers. For this next card, I used strawberries as my inspiration. Mom spends the most time tending to strawberry plants, so it only seemed appropriate. But I couldn't just use strawberries! So I stamped a variety of greenery and flowers. 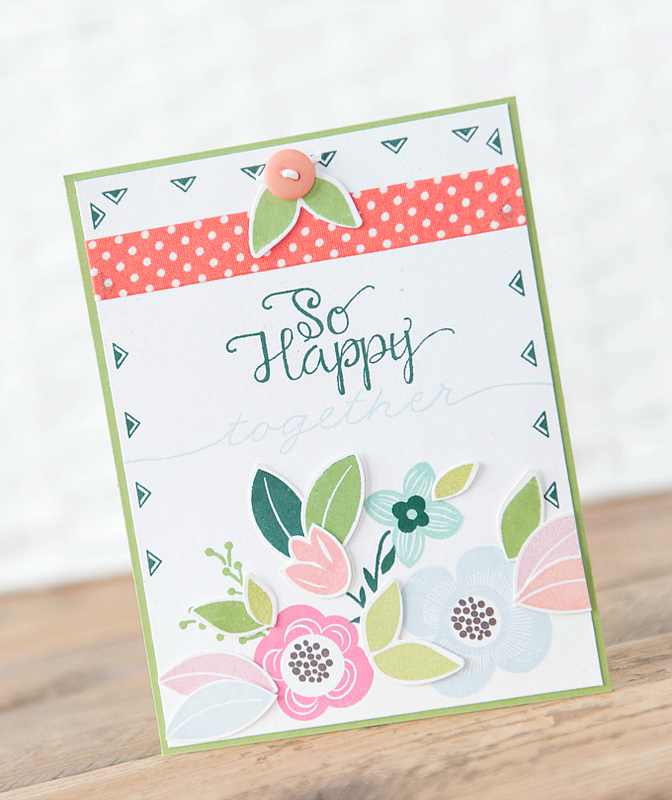 I find the little dots and florals add the most fun and vibrant look! 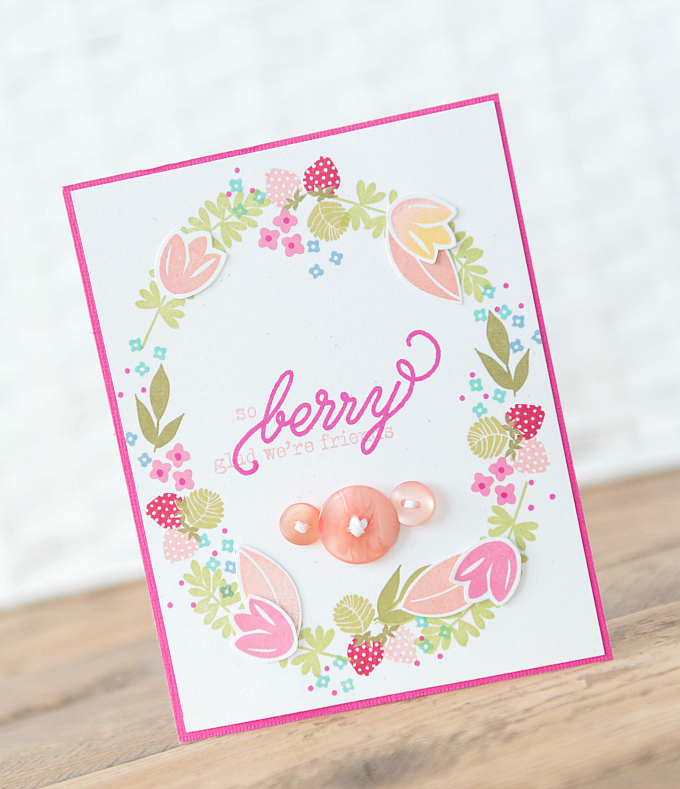 Try it on your next card, and I promise you'll love the result! 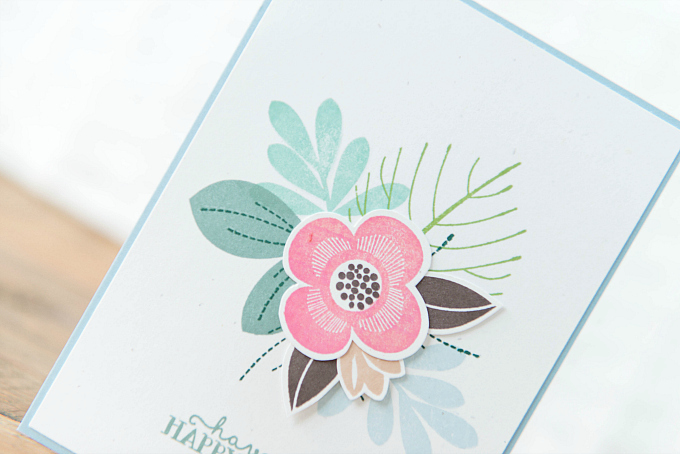 For this card I used Papertrey Ink colors: Green Parakeet, Simply Chartreuse, Hibiscus Burst, Raspberry Fizz, Pale Peony, Sweet Blush, Hawaiian Shores, Blueberry Sky, Pure Poppy, and Bright Buttercup. Next up, a little more floral version, perfect for an engagement, wedding, anniversary or any other occasion celebrating love. For the flowers, I used my newest stamp addition from Close to My Heart, Shower Flowers. I looove this set so much! It's modern, bold, layerable, buildable, and so fun to play with. 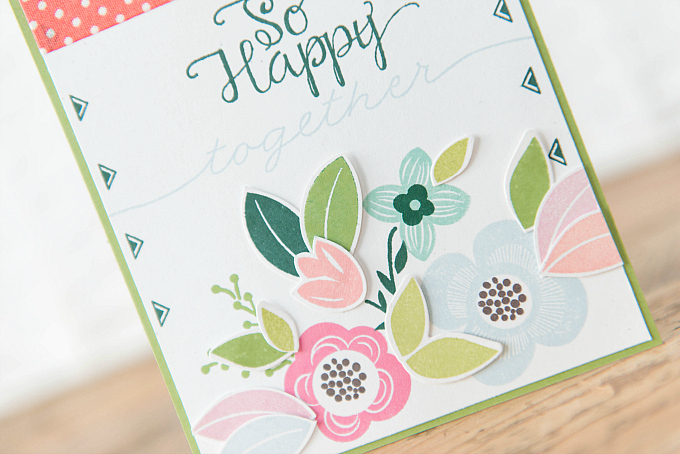 PTI colors used here: Pinefeather, New Leaf, Hawaiian Shores, Spring Rain, Pale Peony, Lovely Lady, and Green Parakeet. The itty bitty border around the edges is from PTI Southwestern Style stamp set. 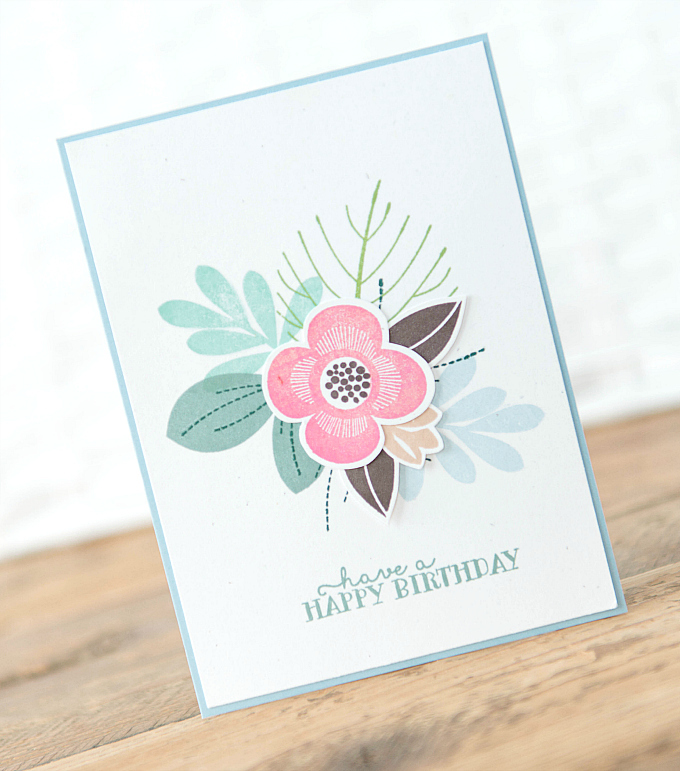 Last card in the set, is a simple birthday greeting, featuring Shower Flowers stamps, sentiment from Southwestern Style stamp, as well as bold, big leaves from Papertrey Ink's Leave It Be (one of my all-time favorites). Colors used: Hibiscus Burst, Spring Rain, Smokey Shadow, Ocean Tides, Pinefeather, and New Leaf. That's it for me today, friends! If you're in need of some cards for your gift-giving, or feeling like gifting something homemade, these little numbers can be found in my Etsy right now! What a sweet bunch of cards!! 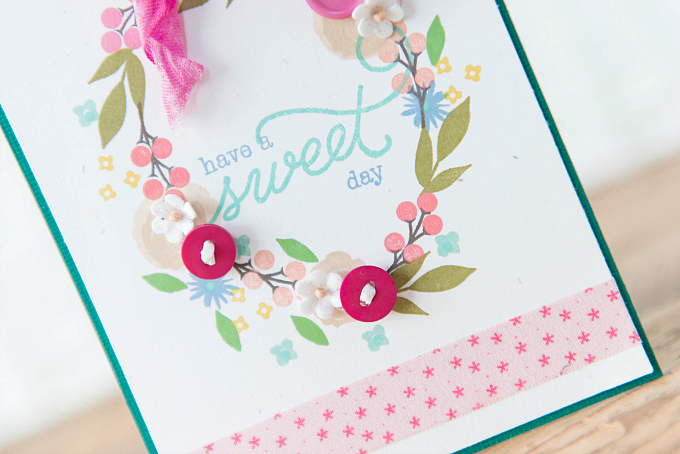 I love the light colors that you are using and the little details-like the buttons. So pretty! !